If you haven’t already had one, you can rest assured at some point soon you’ll get one. What am I talking about? That one star Amazon review where the reviewer has gleefully ripped your novel apart in public. Most reasonable people who don’t enjoy a novel will either choose not to provide a review, or if they do, will attempt to be as constructive as possible. However, as in all areas of the Internet world, trolls lurk around every possible corner, ready to pounce. If you only have five and four star reviews they’ll be eager to drag your average down. They’ll love saying things such as - ‘If I cud give no stars, or even better, minus stars, then this pile of rubbish would of got em. My advise is dont read it !! !’ Yes, so often they are littered with spelling mistakes and grammatical errors. So how do you handle a negative review of this sort? My personal opinion is to completely ignore it. Don’t in any circumstances try to challenge what has been written by entering into a war of words. I have one character in my current novel who has a personality disorder. One reviewer commented that no one would behave in the way my character did in the novel. Part of me was tempted to say something, but I resisted the urge. What the reviewer didn’t know is that I sought advice from my wife about personality disorders, when developing the character . . . as she is a consultant clinical psychologist, and is well versed in dealing with people who have such disorders. So often a reviewer will make a comment, not knowing what they don’t know. All of which leads me on to perhaps the most irritating comment reviewers so often make - ‘It was too far-fetched’. Fellow author Jill Edmondson invited me to write about this very subject on her blog, so I won’t repeat verbatim here what I said, but suffice to say, people who think in black and white will very often not understand creative concepts, ideas or anything out of the ordinary. They’ll not see one shade of grey, let alone fifty, and will often write a review in total ignorance. One other good way to make yourself feel better about the review is to look at other products on Amazon. Search for something you've purchased, and are delighted with. There is a very high chance that someone will have a totally different opinion. Just consider the music you like, and others don't, and vice versa. Opinion is totally subjective. Finally, just remember you are one of a select few . . . a person who has actually written a book, and published it. Many people have the desire to write a book. Very few start one, and even fewer finish one, let alone publish it. It is very easy to criticise another person’s efforts, but it’s a lot harder, as all authors will testify, to provide other people with the opportunity to read something in the first instance. If the vast majority enjoy your work, then feel satisfied you’ve done a good job. Satisfying everyone is an impossible task. Here is a clue about tomorrow's post. Excellent post, Clive. I read the 1-star reviews out of curiosity. I then shake my head and say, "Bless their heart." Great advice, especially with so many self published authors like me, out there. You can either let these comments get to you, not reccomended, or create an even better novel. Option two is what I aspire to. Keep writing and stay cool. Thanks for the advice. Very encouraging for debut novelists. Great and timely advice - definitely helped me out! Can't please everyone, it's true, and though it would be better not to read ANY review, few of us authors can resist. As a reader, I always read the one star reviews first, I'm afraid. Depending on what they say, I'd then look at the 5 star ones. Obviously those people out to be spoilers can be ignored but some books don't deserve a flood of 5 stars and at least with a 1 to 5 system, you get a variety of opinions. What I don't like is seeing a new book - from a well known author - with maybe 10 - 5 star reviews that more or less say the same thing because I'm not convinced they haven't been put there by publishers' puppets. 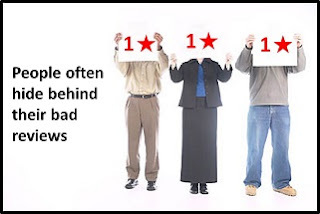 I agree with ignoring 1* reviews on the whole but I could not resist a few scathing comments recently, especially when I discovered the reviewer had given 1* to four of her seven reviews. Can we tackle amazon not to give the 1* reviews such prominence? I feel physically sick when the 1* review slaps me in the face immediately. Should you judge a book by its cover? Is your name on this database? What is "Social Media Jail"? Every author should be on Goodreads! Do book trailers provide a benefit? Do cost per click promotions work for authors? Does your Website/Blog pass the 8 second test? 'Marketing Tips for Authors' was originally set up on my author website - http://www.cliveeaton.com - but I have since decided to create a dedicated blog page. Having been in the corporate world for some 33 years, I'm hoping to bring some of my experience, particularly from the marketing side, to helping fellow authors - hence this blog. I've published my first novel - The Pyramid Legacy - and the sequel is my current work in progress. I'm looking to publish it later this year under the title - Operation Stonehenge.